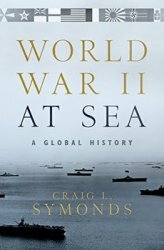 Opening with the 1930 London Conference, Symonds shows how any limitations on naval warfare would become irrelevant before the decade was up, as Europe erupted into conflict once more and its navies were brought to bear against each other. World War II at Sea offers a global perspective, focusing on the major engagements and personalities and revealing both their scale and their interconnection: the U-boat attack on Scapa Flow and the Battle of the Atlantic; the "miracle" evacuation from Dunkirk and the pitched battles for control of Norway fjords; Mussolini's Regia Marina-at the start of the war the fourth-largest navy in the world-and the dominance of the Kid? Butai and Japanese naval power in the Pacific; Pearl Harbor then Midway; the struggles of the Russian Navy and the scuttling of the French Fleet in Toulon in 1942; the landings in North Africa and then Normandy. Here as well are the notable naval leaders-FDR and Churchill, both self-proclaimed "Navy men," Karl D?nitz, Fran?ois Darlan, Ernest King, Isoroku Yamamoto, Erich Raeder, Inigo Campioni, Louis Mountbatten, William Halsey, as well as the hundreds of thousands of seamen and officers of all nationalities whose live were imperiled and lost during the greatest naval conflicts in history, from small-scale assaults and amphibious operations to the largest armadas ever assembled.